Surprisingly little is known of Dewi Sant / St David the patron saint of Wales. Much of the information derives from a life written 500 years later in the 11th century by Rhygyfarch one of whose aims was to prove the independence of the Welsh church from the see of Canterbury. It is likely that he was born near the present city of St David’s in Pembrokeshire. 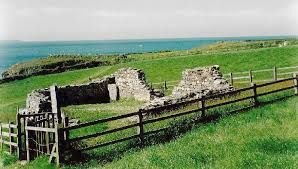 The ruins of an ancient chapel dedicated to his mother, St Non, and his reputed birthplace can be seen in a field near a holy well and the retreat centre of St Non with its more modern chapel. He may have been educated by St Paulinus at Hen Fynyw near Aberaeron. Rhygyfarch claims that David was consecrated bishop by the Patriarch at Jerusalem together with Padarn and Teilo though there is no evidence of this. He became known as a teacher and preacher and founded a monastery at St David’s on the site of the present cathedral. His monastic rule was very strict. 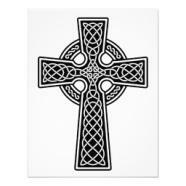 The monks had to plough the fields without the aid of animals and were allowed only bread, salt, herbs and vegetables. David became known as Dewi Ddyfrwr (David the water­drinker) and would pray while standing up to his neck in cold water. David attended the Synod of Brefi called about 560 where his preaching against Pelagianism impressed his fellow clerics and he may have presided at the Synod of Victory at Caerleon about 569. 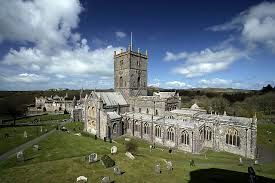 Later his shrine in the new Norman cathedral became a place of pilgrimage and the Pope decreed that two pilgrimages to St David’s equalled one to Rome, and three pilgrimages were the equivalent of one to Jerusalem. The shrine was destroyed at the Reformation but bones thought to be those of St David and his friend St Justinian were discovered later and placed behind the High Altar of the cathedral. The reliquary which contained them was presented in the 1920s by Patriarchs of the Orthodox Church. Recent carbon dating has cast doubt on whether the fragments are really those of the saints but nevertheless the original shrine, in the north of the sanctuary, has been restored in recent years. Wales. Wonderworker David, by your teaching you have enlightened all, O Herald of grace. Intercede with Christ God, that our souls may be saved.